DuraSeal Trowelable Wood Filler Red Oak is a safe, non-flammable, waterbased product for use across an entire wood floor. This product fills nail holes and covers other minor imperfections in bare and unfinished wood. It has a fast dry time, blends and adheres well to wood, sands easily and absorbs stain similarly to wood. 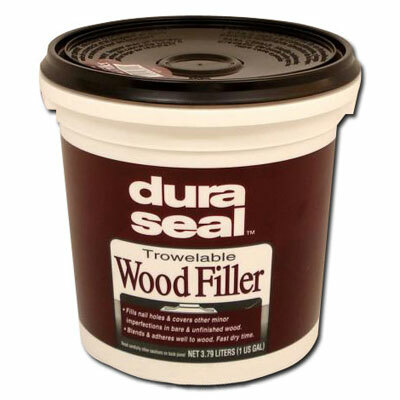 - Pour moderate amount of DuraSeal Trowelable Wood Filler in needed area. - Press filler into cracks and holes using an even-edge trowel. - Allow to fully dry before doing final sanding. - Sand surface to remove excess DuraSeal Trowelable Wood Filler. Clean with water while Wood Filler is still damp.